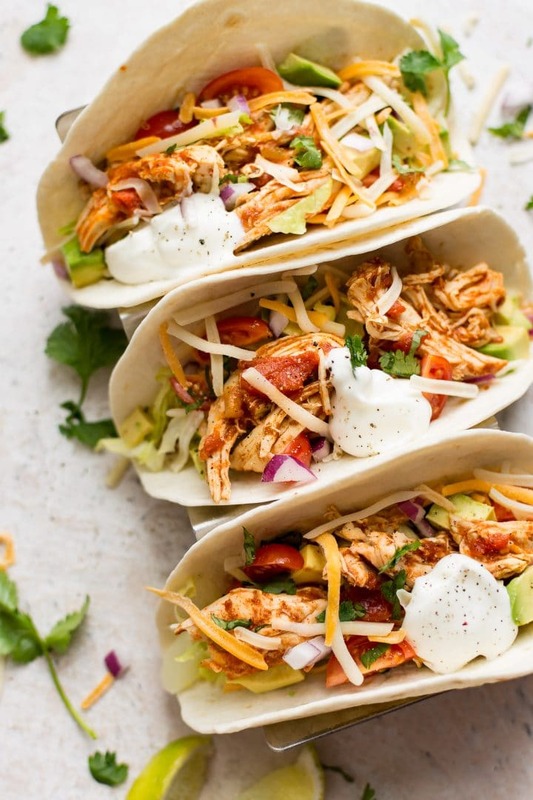 These easy Instant Pot chicken tacos are quick, healthy, and flavorful. The whole family will love them! 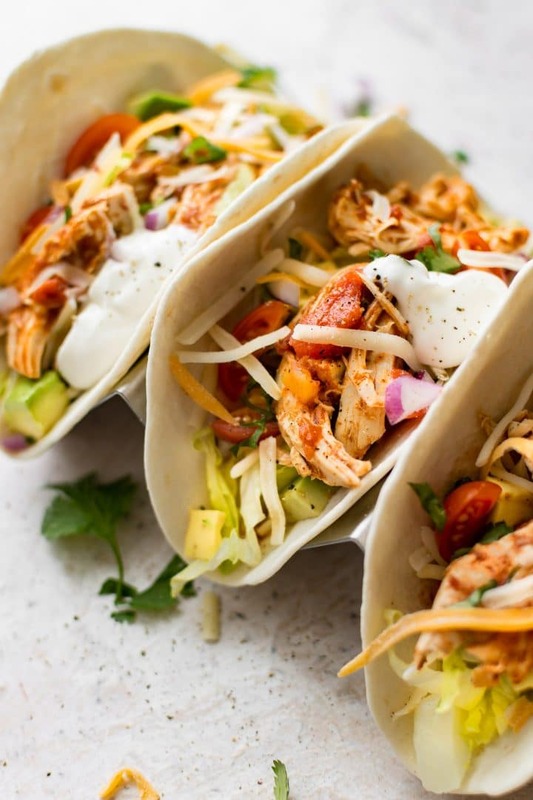 This Instant Pot chicken tacos recipe is perfect for Taco Tuesday or any night of the week. They’re ready in about half an hour total. I like to prep the taco toppings while the chicken is cooking. I have to say that I always get excited for tacos since I don’t have them very often! These electric pressure cooker chicken tacos aren’t particularly spicy, so if you want to add some heat, use hot green chilis instead of mild ones, or add some cayenne pepper. Add all the sauce ingredients (diced tomatoes, chicken broth, diced green chilis, and seasonings) to your Instant Pot, then add the chicken. Let the pressure release naturally for 5 minutes, then do a quick pressure release. Take the chicken out and shred it using two forks. Add it back into the Instant Pot so it’s coated in the sauce. I tested this recipe with chicken breasts cooked on high pressure for 8 minutes, but I found the chicken was a bit harder to shred, so 10 minutes gives it a more “shreddable” texture. Feel free to do them for 8 minutes, though, especially if they’re smaller chicken breasts. You can use chicken breasts or thighs in this recipe. I’d cook thighs for 12-13 minutes. Chicken thighs tend to be fattier (therefore more moist and flavorful). They’re also much more forgiving when you cook them and tend to dry out less easily. Pro tip: You don’t need to use the spice/seasoning mixture I suggest – pre-made taco seasoning is fine if you prefer. I like to warm my flour tortillas by wrapping them in foil and putting them in the oven at 375F for 20 minutes or so prior to serving the meal. 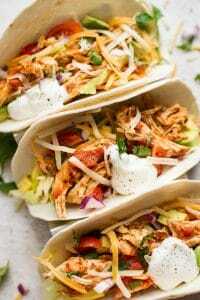 You may also like my Instant Pot BBQ chicken or my BBQ chicken tacos. Will you make these Instant Pot shredded chicken tacos? 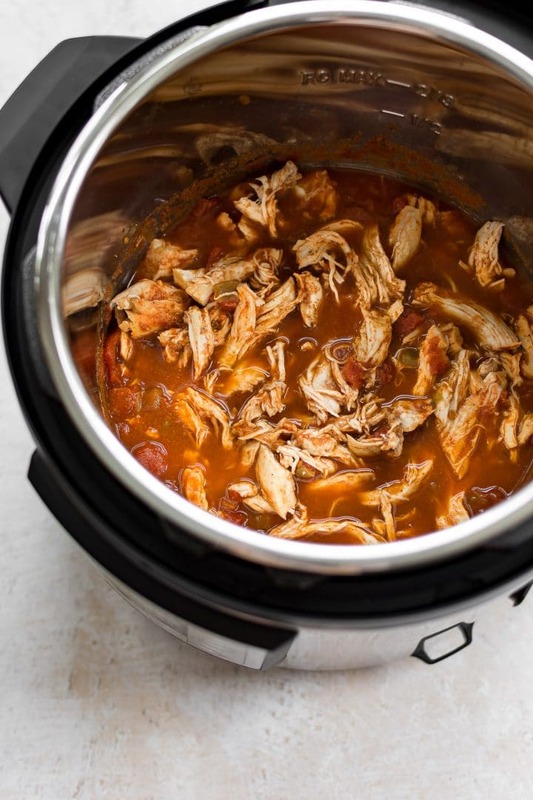 Add all ingredients except for the chicken to your Instant Pot. Give it a good stir. Add the chicken and spoon some of the sauce over top. Close the lid, set the valve on "sealing", and cook on high pressure for 10 minutes. While the chicken is cooking, prep the taco toppings. Once the countdown has finished, let the pressure naturally release for 5 minutes, then do a quick pressure release. Take the chicken out of the Instant Pot and let it rest for a couple of minutes. Using 2 forks, shred it, or cut it up using a knife. Add the cut-up chicken back into the Instant Pot and coat with the sauce. Feel free to use pre-made taco seasoning instead of the spices I suggest if you wish. You can definitely add more chicken if needed (keep cooking time the same) - it makes plenty of sauce. I had about a pound of chicken. You can also use chicken thighs if you prefer. I would cook them a bit longer (12-13 mins. so they're fall-apart tender). If using frozen chicken, I'd add on an extra 2 minutes. If ever in doubt, use a meat thermometer to ensure chicken is 165F. If you want to reduce the sauce: prior to shredding the chicken, take it out of the Instant Pot and press the "sauté" button. Let the sauce bubble away for 5-10 minutes before adding the chicken back in. This was sooo good. I made it exactly as written and it came out perfect. I had a lot left over so I made some rice and mixed up some “burrito bowl” type lunches and even that was delicious. Super easy, fast and tasty recipe…thank you! Yay!! So happy they worked out, Angie! Can I do this in a crockpot? How long do you suggest if so? Hi! I haven’t tested it, but 3-4 hours on high or until the chicken shreds easily should do it. 6-8 hours on low should work too. If you’re worried about it going dry, try chicken thighs. Let me know if you do make it! Can I use minced chicken? Love this! Can’t wait to try! You mean like ground chicken? Hmmm I think that would work, but it won’t take as long to cook. I’m not sure if pressure cooking it is necessary in that case. You could just as easily do it on the stove. Can I use a crock pot for this recipe? Hi! I haven’t tested it, but 3-4 hours on high or until the chicken shreds easily should do it. 6-8 hours on low should work too. If you’re worried about it going dry, try chicken thighs.